Hopefully you're lucky enough to work, as I once did, in an industry that abides by Summer Fridays -- last afternoon of the week off, Memorial Day through Labor Day. If you're not, let's make-tend like you do with a super-short blog post. Gotta catch the Jitney to the Hamptons, where beachside cocktails await! As you might be able to make out in the above pic, the Little Sparrow is a creation courtesy of Death & Co. If you've ever read this blog before, you know that there is, to my mind, no greater seal of cocktail approval. Thus, fittingly, there's little more for me to say about it. Make, enjoy. I want to end this post with a cheerfully expedient "TGIF!" but I don't want you to forge a link, even subliminally, between the Little Sparrow and a TGIFriday's. When I think of TGIFriday's, I think of 1500-calorie Mudslides and servers who don suspenders. 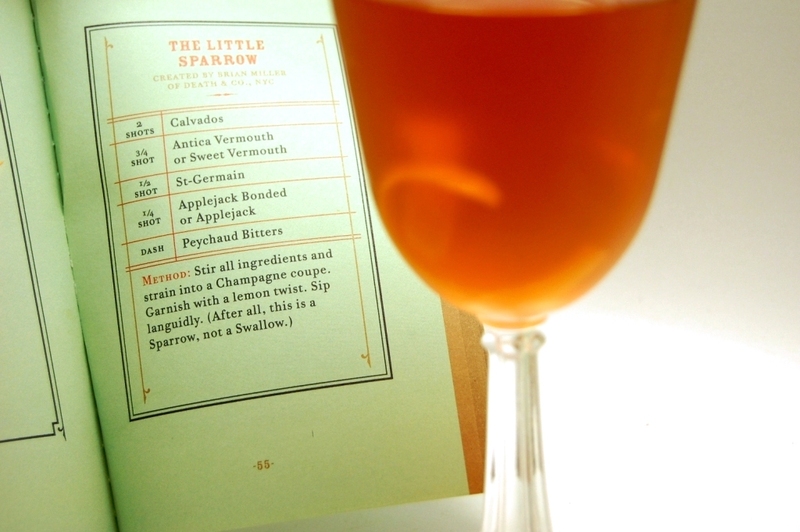 When I think of The Little Sparrow, I conjure an undiscovered boite in the far West Village, perhaps located in the shadow of the Meatpacking District but miles apart in milieu, where I can order a crisp, neatly prepared cocktail... probably from a guy donning suspenders. But not while also wearing a striped polo shirt. Stir all liquid ingredients briskly in an ice-filled mixing glass or cocktail shaker, until right after your boss leaves the office so you can hightail it out of there. Strain into cocktail glass and garnish with lemon twist. As you can see in the pic, the original recipe calls for a teensy bit of applejack as well, which we didn't have. Feel free to throw in some Remy Martin if you like, or don't worry about it.